The Falcons have made a habit of winning ugly in 2012, but the bottom line is they are winning, and right now are the best team in the NFC with a 9-1 record as they head to Tampa Bay Sunday. Atlanta had a close contest not go their way two weeks ago in New Orleans, falling 31-27, and trailed for much of the day in Week 11 against Arizona. But, the team overcame Matt Ryan’s five interceptions to beat the Cardinals 23-19, becoming the first team to win with its quarterback throwing five picks without a touchdown since Green Bay with Bart Starr in 1967. That’s certainly a reality the Bucs (6-4) could relate to during a three-game September skid in which they lost twice in the final minute, but suddenly Tampa Bay is very much a part of the postseason picture. Following three straight double-digit victories, the Bucs rallied from 11 down with six minutes left to force overtime Sunday at Carolina before winning 27-21. Josh Freeman is playing as well as any QB in the NFC right now, and the past few weeks he’s been red hot. Take last Sunday in Carolina as an example. He started slow, but got hot late, and led the team to the big OT win with a TD pass to TE Dallas Clark. The QB has multiple touchdown passes in six straight games while posting a 106.1 passer rating and an NFL-best 8.58 yards per attempt since Oct. 1. Freeman and Jackson aren’t the only reasons for the Bucs’ recent offensive success. Perhaps the biggest is running back Doug Martin, who has run for 592 yards and five touchdowns over the past four weeks and against Carolina joined Adrian Peterson as the NFL’s only rookies since 2000 to gain 1,000 yards in their team’s first 10 games. It’s not hard to picture Martin running well again Sunday. The Falcons are allowing 5.0 yards per carry on the ground – 30th in the league – but are expected to get linebacker Sean Weatherspoon back after a three-week absence. Atlanta does have some other significant injury concerns, most notably receiver Julio Jones (ankle) and cornerback Asante Samuel (shoulder). Even if Jones can’t go, don’t look for the Falcons to throw the ball any less often. Tampa Bay’s defense is the NFL’s best against the run (81.8 yards per game) and worst against the pass (312.6). Ryan’s numbers were MVP-worthy prior to his disaster against the Cardinals, but he’s really been on top of his game away from the Georgia Dome. He’s thrown 19 touchdowns and just three picks in his last seven regular-season road games, completing 67.7 percent of his passes. Visits to Tampa haven’t been nearly as easy. Ryan has five touchdowns and seven INTs in four visits to central Florida, posting a 63.2 passer rating while going 2-2. 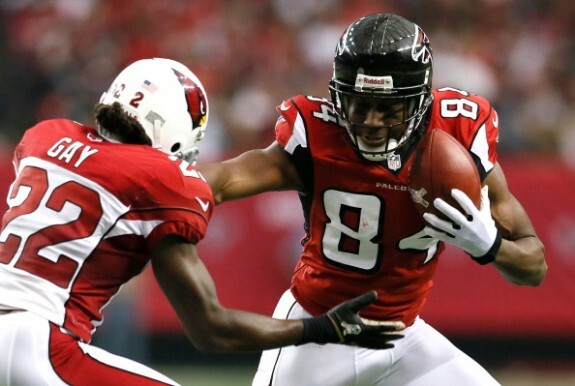 Freeman, meanwhile, has six TDs, 10 picks and a 62.5 QB rating while going 1-4 in his last five games against Atlanta. I like the Bucs here, and for a number of reasons. The Falcons simply can’t put their feet in the fire for another week and get out with no damage. In other words, just like two weeks ago they are due to lose a close game. Freeman is playing lights out, and I think the Bucs D will do enough to get the job done, and while the game isn’t sold out, those Bucs fans that are there, will enjoy the big win. What Team Wins Sunday’s Falcons-Bucs Game?